One of the first baskets sold by Lucy Telles at Yosemite, 1912. 10 1/4" diam. 4 1/2" high. She got $25. Lucy Parker Telles (1870-1956) was of Yosemite Miwok and Mono Lake Paiute descent. Shortly after her son Lloyd was born in 1902, her husband Jack Parker, Paiute, died. Miwok and Paiute peoples of the Yosemite area had begun to find new occupations with the influx of tourists and status of Yosemite valley as a National Park: guides, domestics. 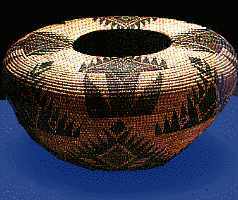 Traditional lifeways were partially supplanted by a money economy, with purchased beans, coffee, white bread and purchased cloth supplementing the traditional acorn and fish. 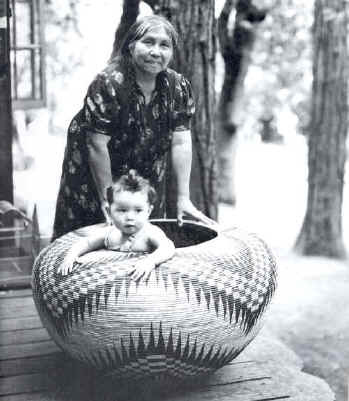 To support her family, Lucy turned to basket weaving, which she had learned as a child. 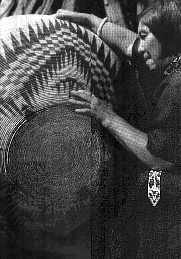 Her innovations had a large and continuing influence on the styles of Yosemite weavers. She modified traditional Miwok shapes. More importantly, she began to use 2 colors where by tradition only one per basket -- either black from bracken fern root or red from split redbud twigs -- had been used. She adapted motifs from the showy Plains beadwork that was just reaching the area. Her designs were large, often had stylized pictorial elements arranged in overall symmetric patterns, making the whole basket surface one unified design, like the high-shoulder gift basket shown above whose price seems astonishingly low now, but was high for the early 1900's. By the 1920's, she was acknowledged as the best weaver in the valley, and other women were copying the style innovations she had introduced.